What if my business, project or location isn’t eligible for New Forest LEADER funding? If the basic eligibility checks indicate your business, location and/or project is not eligible for New Forest LEADER funding, there may be other resources available to you. The links on this page take you to external websites. Please contact the specific scheme administrators for more information. There are LEADER Local Action Groups across the UK. Therefore if your business or project is outside of the New Forest LEADER area, visit the Defra website www.gov.uk/rural-development-programme-for-england-leader-funding to find the contact details for other Local Action Groups who may be able to help. The Countryside Productivity Scheme is managed by Defra. Funding is available to help farmers and foresters to innovate; to utilise new technology and latest research in their business; to start-up a business or to improve skills and training. An initial Capital Grant offer opened in March 2015 and other offers are being introduced on a phased basis during the 2015-2020 period. Grants may be available for innovative equipment or infrastructure in priority policy areas, such as energy saving, water efficiency, reservoirs, animal health, slurry management. Support for training, knowledge exchange and demonstration activity through a new skills offer, will be available from summer 2015. There is a link to grant search website available on the New Forest Business Partnership’s website at www.nfbp.org.uk. This will enable you to search for all available UK and EU grants against specific search criteria. b. Action Hampshire provides grant information for groups managing village halls and other community facilities. 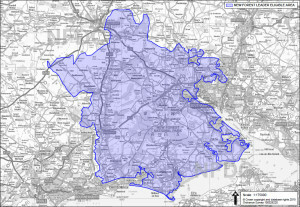 See www.actionhampshire.org.uk or call 01962 857358. LEADER cannot fund training for agriculture, horticulture and forestry. Instead, support for training, knowledge exchange and demonstration activity will be available through Defra Countryside Productivity Scheme. Please contact Defra direct for more information via www.gov.uk/how-to-apply-for-grants-countryside-productivity.